The ITIL V3 qualification will continue to be available until AXELOS advise that the transition period will cease. Therefore we would encourage you to transition to the new scheme as soon as possible. Once the V3 qualification is phased out, the Practitioner level certification will no longer exist. ILX Group’s accredited ITIL Foundation and Practitioner classroom learning course contains all of the training and materials you need to attain both the Foundation and Practitioner qualifications in ITIL. ITIL Foundation will give you the knowledge of the internationally-recognised best practice terminology, structure, basic concepts and the core principles of ITIL practices for service management to fully prepare you for the ITIL Foundation examination. The ITIL Practitioner classroom course will give you the ‘how' and will fully prepare you for the ITIL Practitioner examination. The critical competencies covered are organisational change management, communication, measurement and metrics. 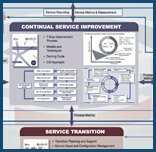 The course will benefit IT service management professionals who want to become ITIL Foundation-certified to understand the global language of ITSM, and then want to learn how to adopt and adapt it in the workplace. In order to take the Practitioner examination you must have already passed the ITIL Foundation exam. It is important to note that ITIL Practitioner is not a pre-requisite for intermediate levels. Staff will learn three critical competencies (organisational change management, communication, and measurement and metrics) and be equipped with a comprehensive toolkit to drive improvements on return to the office. Open book, i.e. the ITIL® Practitioner Guidance publication is allowed for reference during the examination.